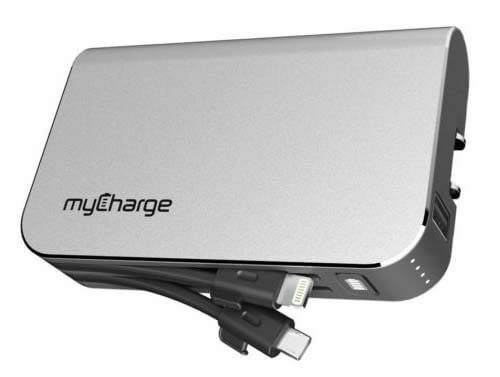 Here’s the five second review of the myCharge HubPlus: where have you been all my life? Now for the more detailed review. The HubPlus is a 6700mAH portable charger that has an integrated Lightning cable and micro USB cable. A USB port on the top of the charger adds additional charging flexibility. To charge the device itself simply plug it into any wall outlet. Four lights designate full charge/battery level. It took about three hours to fully charge the HubPlus. But the magic with this device is in the charging of devices: it’s unbelievably fast! In a matter of minutes my iPhone battery increased 30%. On an overnight trip I brought the HubPlus for my iPhone and Apple Watch. The watch cable was plugged in to the USB port while phone used the HubPlus Lightning cable. The HubPlus charged both devices with battery to spare. I haven’t recharged the battery since before my trip a few days ago and it still has 50% capacity. Two minor things to watch out for: the cables are short, therefore it could be a bit awkward to charge and use your device, depending on your situation and location. The cables have a little notch to pull out the cable from the charger. On my HubPlus they’re a bit snug; if you’re like me and have long fingernails that easily break, a good solution is to use a pen to pull the cable out. Overall, I love the HubPlus, and have been using it almost everyday. It’s a bit pricey, but the convenience and quality far outweigh the cost concerns. The ability to charge up to three devices, especially while traveling, is a game changer. MyMac.com Review Rating: A strong 9 out of 10. Highly recommended.